In this tutorial I’ll show you how to easily change the GO Map character with an animated 3D model. I’m going to use the “Hellephant” model from the Unity “Zombie Toys” game that’s available freely on the asset store. Bye the way “Zombie Toys” is a very nice project to learn the unity basics and I suggest you to take a look at it. There’s also a courseware that’s entirely about it’s making and it’s really great. Why the Hellephant and not the “Zombie Toys” player character? I mean have you seen it? It’s just so cool. 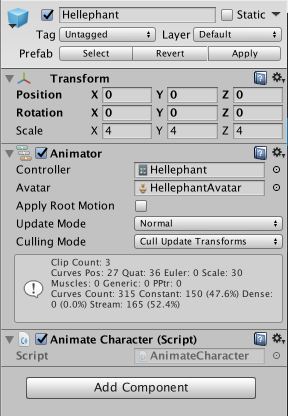 Let’s start by importing the Hellephant model into the project and set up the animator controller. You can import the model wither from the zombie toys project or from this unitypackage. If you use the package above you’ll find everything you need in it, otherwise you’ll maybe need to cut the animations and create an animator controller that looks like this. Now that you have set up the model let’s import it into the scene as a prefab. 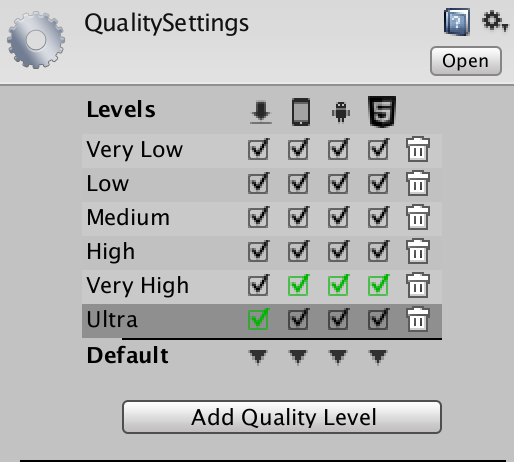 However there’s already a scene with everything set up in the unitypackage above. 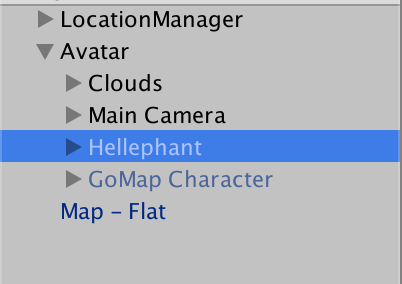 Put the hellephant prefab at the same level of the GoMap Character in the hierarchy. 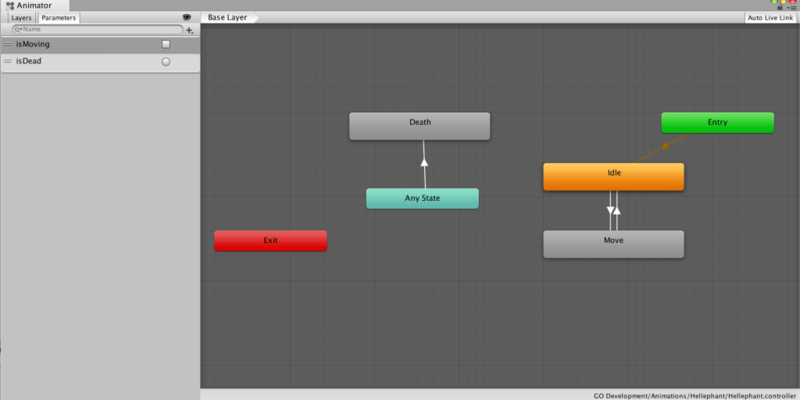 And Check that it’s inspector looks like this, with a “Animate Character” component attached to it. 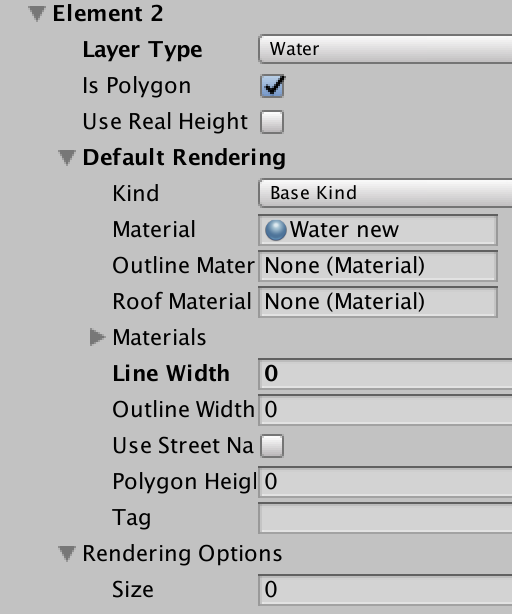 Now select the Avatar gameobject in the hierarchy and drag the Hellephant prefab in the “Avatar Figure” property. 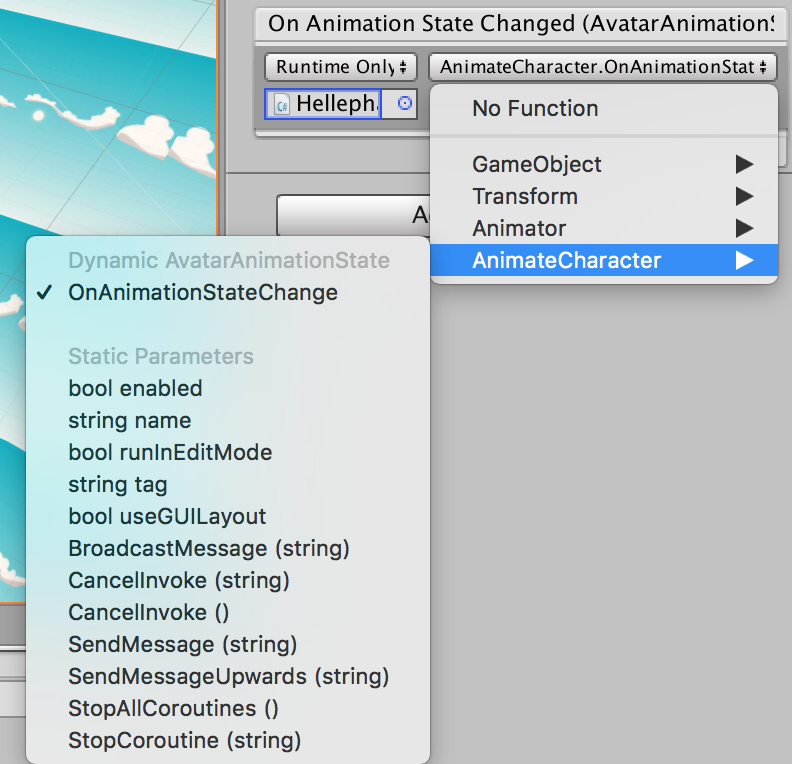 In the OnAnimationStateChanged Event Panel at the bottom of the inspector you just have to click on the plus icon to add a new listener, drag the Hellephant gameobject in the object property and select the “OnAnimationStateChange” method of the AnimateCharacter component. That will do the trick, sending animation state change events to our simple script. This script is quite simple. It just implements a method which has a switch for the different animation states and triggers the right animation. Job done, that easy. The MoveAvatar script basically does all the work for you. In this way when you move with GPS updates your character will animate accordingly. Based on your real world speed. Sadly the hellephant only has a move animation without a run animation. I’ll leave to you the setup of a model with 3 animations editing the AnimateCharacter script. If you don’t know already IndoorAtlas… well you should! IndoorAtlas is an Indoor Positioning System that will dramatically increase the accuracy of location based applications inside venues, offices and other buildings. That combined with their recent Unity SDK makes possible developing a new kind of mobile apps oriented toward 3D indoors exploration, mixed indoor/outdoor location based gaming and AR apps. With GO Map 3.1 using IndoorAtlas as the core Location provider is really a matter of minutes. A new IALocationManager.cs will take care of almost everything, giving you complete access to the IndoorAtlas SDK features. NATIVE location API instead of the Unity default one. In fact IndoorAtlas plugins works really well both in outdoors and indoors, better than than Input.Location api with more accurate location events. So that’s a huge bonus. In this tutorial I’ll show you step by step how to get started with GO Map and IndoorAtlas. 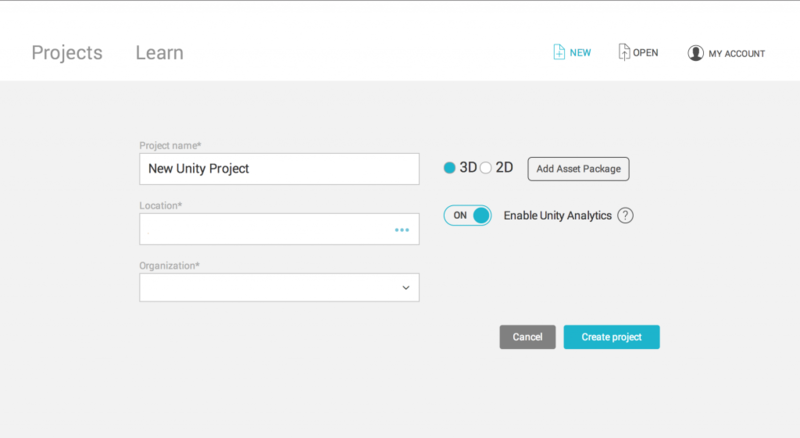 Start by creating a new Unity project and import GO Map 3.1 from the Unity Asset Store. Open the Plugins folder and delete this classes that are already contained in GO Map 3.1. Basically everything except for the folders and the IaBehavior. Search for the “Flat Map – IndoorAtlas” scene and open it. The main news is that there’s a new kind of Location Manager that will use the IndoorAtlas native location updates to make GO Map and everything else in the scene work. If you take a look to it you’ll find many of the classic Location Manager features like Zoom Level, World Scale and the desired accuracy. 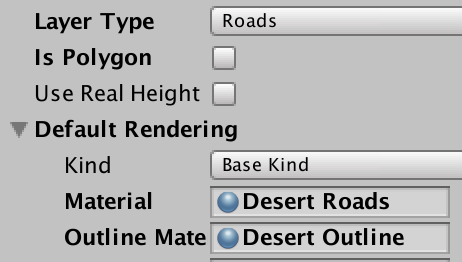 Of course there still is a location dropdown for In-Editor test runs. 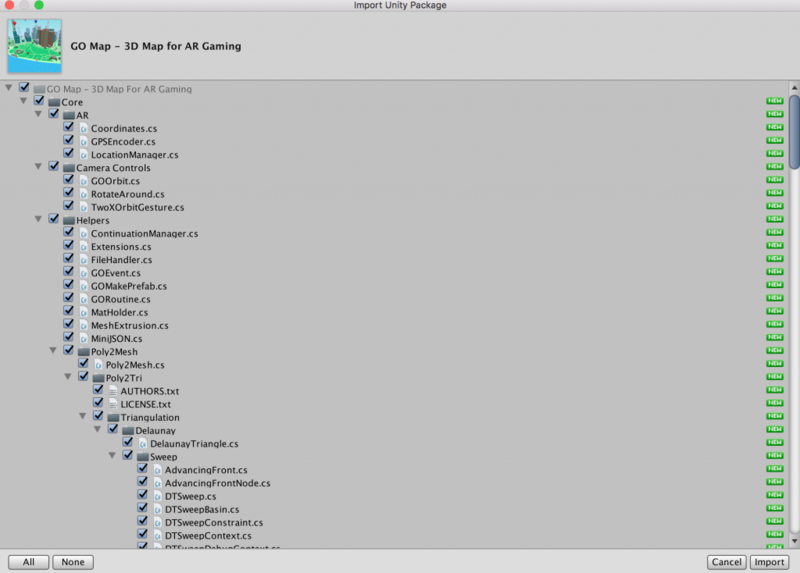 Other than the classic Location Manager Events, all the IndoorAtlas SDK updates are wrapped into Unity Events so that they can be used via Unity Inspector. 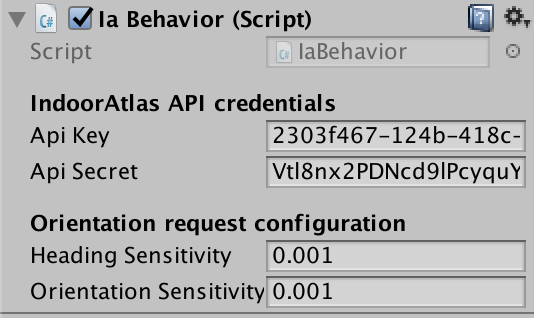 Now select the Location Manager Game Object and add another the IaBehavior Component to it. This step is crucial to make it work. At this point you should make your account on the IndoorAtlas website and follow their walkthrough to get started and make your first location. The above is described in more detail in their workflow documentation here. When you get your API Key and API Secret you can enter them into this component. Also set the Heading and Orientation Sensitivity to 0.001. This demo scene is nothing more than the classic Flat Map but using the IndoorAtlas SDK updates. 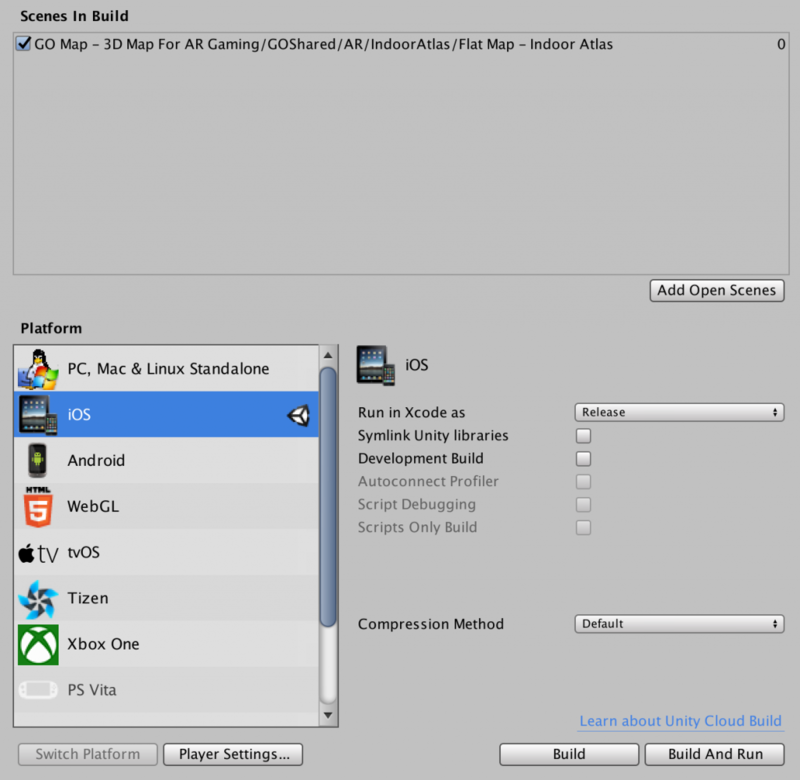 The next steps of this tutorial will show you how to make an iOS build and try it on your phone. From the iOS player settings set the target minimum version to iOS 8 ore more. That’s a requirement for IndoorAtlas SDK. In the OSX Terminal and press enter. That will install cocoa pods. And you’ll need it to install the IndoorAtlas iOS SDK in your XCode project. Open again the OSX Terminal and go your xcode project path. You can type cd, then drag and drop the xcode project folder and press enter. and press enter, this will install the IndoorAtlas.framework into your XCode project. Now you can open the XCode workspace and build the app to your iPhone/Ipad. You should see an overall improvement of your GPS position mostly inside the area you have mapped with the IndoorAtlas application. The next steps could be adding a 3D model of the mapped building/venue to the scene and geolocalize it using the GOObject component. This is the most frequent use case of GO Map users, but you can find plenty other IndoorAtlas use cases here. In this tutorial I’ll show you how easy it is to add your gameobjects to specific latitude/longitude coordinates. I tried to make this kind of operations as close as possible to any other maps sdk that you may already know (iOS Mapkit, Google maps) but I assure that it’s really easy even if GO Map is your first map sdk. In this tutorial we’re going to make from scratch a script to download features from Google Places.  The script is already contained in GO Map asset but in this tutorial you’ll understand how it works and how to make a similar script to retrieve another POI dataset from your API. This tutorial will be a lot useful to you to understand how GOMap events works and how you can use them to your purposes. There are many ways to get a dataset of objects that can be displayed on a map, whether if it’s for a location based game or a mobile app. You could use a free online API, build your own one on your server, or just have a local json file with a list of features in it. But in the end it’s always the same story, you would have a way to query data based on latitude/longitude coordinates and just parse the response to a list of geolocalized objects that you show on the map. GO Map will ease the process as much as possible but you still have to code a bit, if you want to use your own API. So in the end: Google Places is just one of the possible apis. I have decided to use it because of its worldwide scale and for the large amount of features you can get from it. So let’s start from a simple basic scene with GO Map, Avatar, and Location Manager. You can copy the one used in first tutorial. Then create a new Game Object and name it GOPlaces. Attach to it a new component named GOPlaces_new and open it in monodevelop. Let’s add some public attributes that we will use later like a link to GOMap and a box to enter your Google API key (make one here if you don’t have it already). Add also a string with the base “nearby search” API url, that’s the one we’re gonna use. We are going to make light to how events can be used in unity instead of update loops and other stuff to invoke our methods at the right time. GO Map offers a handful of useful events that you can use in your own scripts, in this case the OnTileLoad is the right one. OnTileLoad is triggered every time a map is created, and a GOTile object is passed in input. This is the Awake() method of our script in which we register the method “OnTileLoad” of our class to the OnTileLoad event of goMap. The nearby search API works receiving in input a center (latitude, longitude), a radius (in meters) and a type of POI we want to receive back. Beside the “type” attribute we have to get the other two from the tile so that our request will give back only the features that are contained in the map tile. As you can see from the drawing a tile is rectangular but the Google Places request works with a circular area. That means we have to choose if we want to take the big circle or the smaller one. In the first case we risk to have some features duplicate in various tiles and in the second we risk to miss out some features in the tile corners. We are going to request for the bigger circle and then try to filter out the features outside the tile bounds. Let’s also add the “type” public string at the top of your script so we have everything for our request. Enter the word “Cafe” in the inspector. We have now to perform the request to the Google Places API, and this is kinda easy using the Unity WWW API. Just format the url like Google wants and we’re done. Then we just deserialize the response and we’re (almost) ready to add our places to the map. Open it in your browser to see the response in json that we are going to parse next. Basically we have a list of features under the key “results” and for each feature we need just the coordinates and the name, but there’s a lot more if you want dig deeper. "vicinity" : "32 Rue Duret, Paris"
Let’s add a public GameObject attribute with the prefab we are going to instantiate for each one of the POIs. Get the list of places from the response, create a container for the places and set it as a GOTile child. In this way when the tile is destroyed by GOMap it will destroy also all the places. That’s how we loop through each place data and spawn our Game Objects. But I really want to dwell for a moment on the Game Object Instantiate and position part of this code. This four lines are just everything you will ever need to place whatever GameObject onto GOMap. Whether it’s a little monster, a tree, a flying dragon or the position of another player this is the fastest way to spawn it on the map. Convert the GPS coordinates to a Vector3 using the method convertCoordinateToVector passing the desired height value at which your game object will be spawned. Assign the converted vector3 to the transform.position of the new GameObject. As promised we still have to do a method to filter out the Places outside the current tile, remember? We are going to use a fantastic property of the Coordinate class that gives the current tile coordinates (in the tile coordinates system) at a given zoom level. The returned tile coordinates are just a way to represent the tile in which a given GPS coordinate is in. The zoom level of the map is needed to make this work right. So basically, if the tileCoordinates are the same as the current GOTile the Place is in the tile, otherwise it’s not. That’s it, you will find the GOPlaces script here and in the next release of GOMap. Or do we want to make things a little bit cooler? 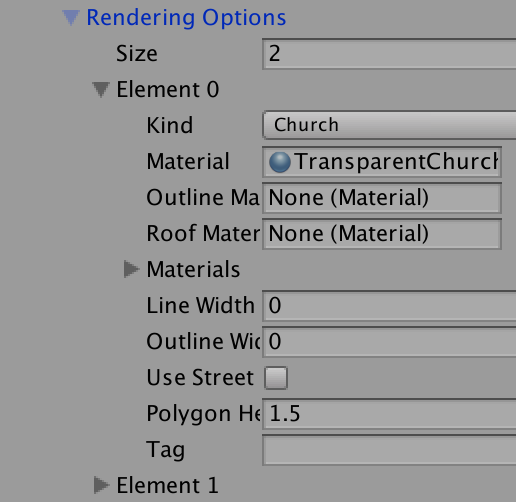 Let’s add a component to each POI created, storing all the place properties in it. Then create a new prefab instance that is sort of a coin with a sprite renderer in it. The GOPlacesPrefab.cs component will take care of the further customization in its start method. That’s all, I’ve added just a simple cache system for the icons in the final version that you can find here. GO Map is a project started over a year ago (summer 2016) to help every developer who wants to build a location based game in Unity 3D. 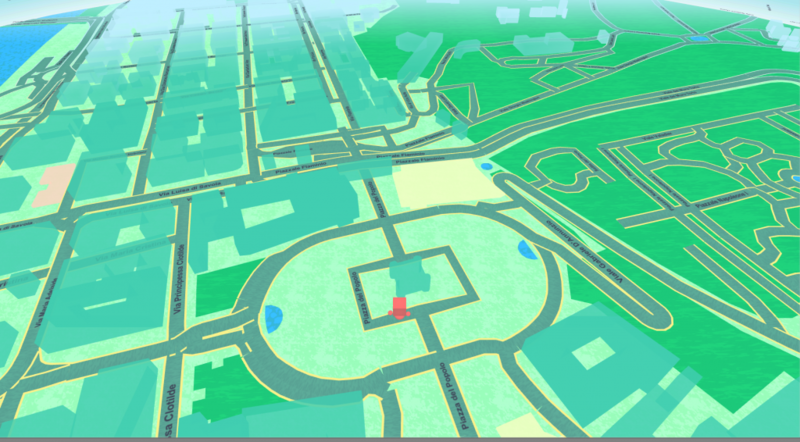 When pokemon go was released I noticed that among the thousands of plugins on the Unity Asset Store there wasn’t basically anything related to maps and absolutely nothing closer to the map of the famous Niantic game. 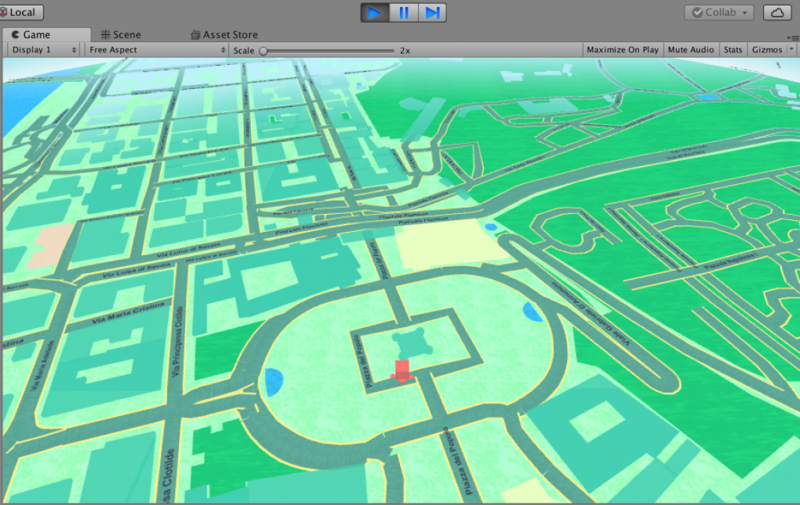 The goal of this project is to let developers build location based games without having to think at the map part at all. With GO Map you won’t have to code again a 3D map for your game (And trust me it’s a lot of time saved) letting you focus 100% on your game logic. Let’s start this series of tutorials with the basics. 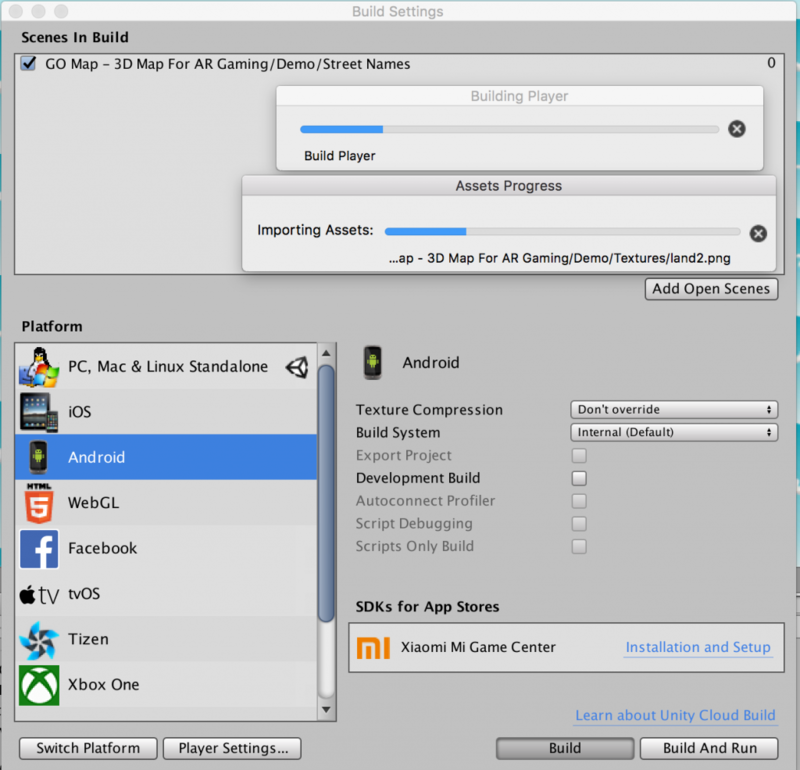 Download GO Map, import it in a new project and build on a mobile device using real GPS information. Possibly using Unity 2017.1 or higher make a new project in the folder you want. Click import and make sure that all files are selected, then click import again. 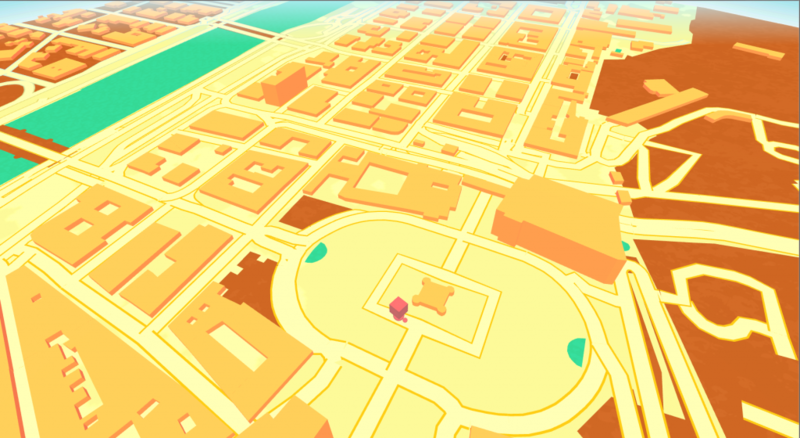 Navigate the GO Map folder and open the “Flat Map – Pokèmon GO Style” demo scene. At this point you’ll notice that there are some Game Objects in the scene, they are all well covered in the GO Map documentation so right now let’s focus to the most important and make a quick build. Select GO Map and take a look at the inspector panel. You’ll see that there are 3 input fields to insert API key for Mapbox, OSM or Mapzen_legacy (if you have your own mapzen server), and they are all marked by a red !. 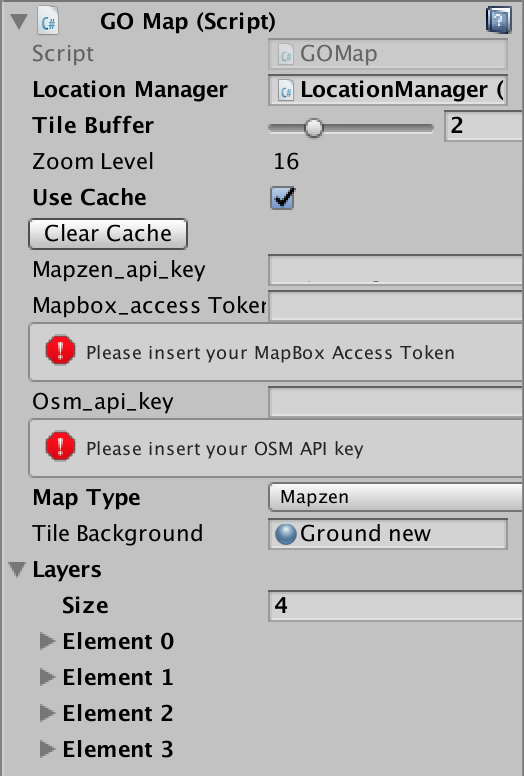 That means it’s time to make your own map API key, choosing one service among the 3 listed above. I will show you how to make an API key for Mapbox, but it’s really the same for the other two services. Once you have an account you can open the dashboard and receive your own access token. Copy it to the clipboard and go back to Unity. Paste your Mapbox Access token in the input field named “Mapbox_access_token” of GO Map (script). 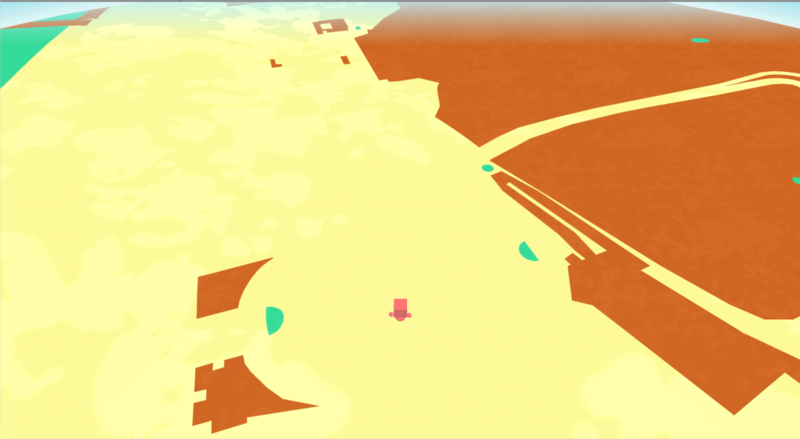 Then press play and you’ll see the map will load fine inside the editor. 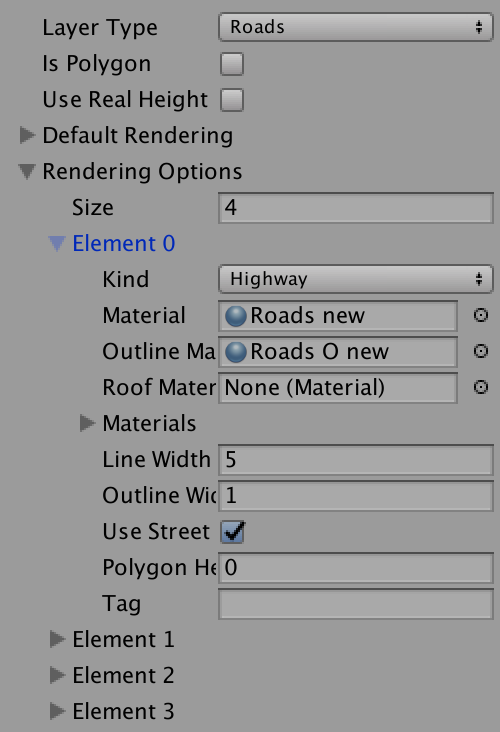 The location used for editor builds is set inside the LocationManager (script) on the Location Manager GameObject. Feel free to try other location if you want. 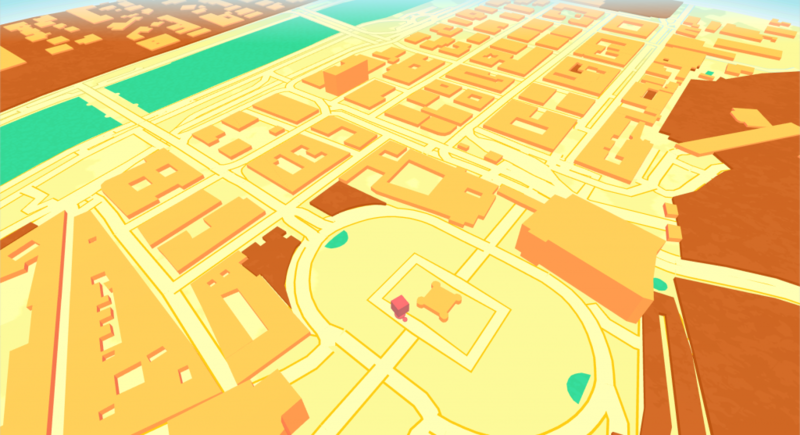 Building this scene to your smartphone will use its GPS device. That preference is also set in the LocationManager inspector and it’s named “Use Location Services”. So open the Build Settings from the File/Build Settings menu and add this scene to the build by clicking on the “Add Open Scene” button. Select the player you want to use (Android/iOS) and open the Player Settings. Change the “Package Name” to a different value than default like for example “com.gomap.demo” and you are good to GO. Just press build and run on with the device attached to your computer. If you are building to iOS please add the “Location Usage Description” in the player settings. This will include in the generated .plist file the string to prompt when requesting Location Permission. Keep in mind that without this string your app won’t have permission to use GPS. Press build and run with the device attached to your computer. If something goes wrong press build again from the generated XCode project. That’s it, now you have GO Map working with real GPS on your mobile device. Disable V Sync in quality settings for faster map loading. Increase quality level for each player (ios/android) to have better looking graphics. Try out GOMap most famous style “Flat Map” in this web demo! Feel free to search for any address or input GPS coordinates (lat,lng format) in the searchbar and see how is the rendering for that area. This demo is made using Unity WEBGL Player, so please use one of the supported browsers. Want to know more? Read documentation. You may find it a bit laggy, that’s because of the lack of multithreading in the webgl player. There’s absolutely no lag when building on smartphones or any other multithreaded device.